Summary: As our Lord was setting in the temple area teaching the people, there is this hullabaloo outside. Then here comes these religious rulers dragging a woman with her clothes in disarray, her hair all disheveled, defiant, and resisting them. Chapter 7 told of Jesus teaching during the Feast of Tabernacles and the great stir He caused among the Sadducees and Pharisees. They tried to have Him arrested, but couldn’t, because His time had not yet come. And then the feast was over-(John 7:53) And every man went unto his own house. No one invited Jesus into his home. It was a feast night, but Jesus went out to the Mount of Olives. As far as we know, He never spent a night in Jerusalem. How about you, my friend? Do you go to your own home and leave Jesus out in the cold? Or have you accepted His wonderful invitation, so that you live in the love and light of His presence? 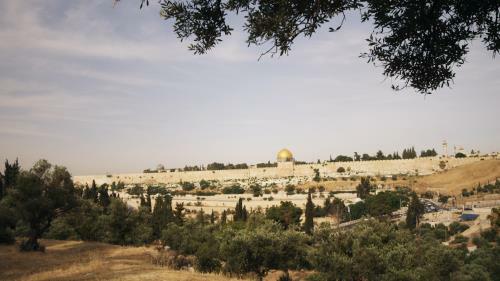 (John 8:1-2) Jesus went unto the mount of Olives. And early in the morning he came again into the temple, and all the people came unto him; and he sat down, and taught them. Remember that the night before there had been a meeting of the Sanhedrin and that people were divided in their opinion as to whether or not Jesus was the Messiah. Nicodemus defended Him. Everyone had gone home, and not one had invited Jesus to his house. 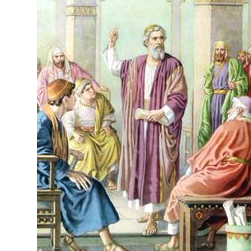 Early in the morning, He came back to Jerusalem, went back to the temple, and sat down to teach. (John 8:3-4) And the scribes and Pharisees brought unto him a woman taken in adultery; and when they had set her in the midst, They say unto him, Master, this woman was taken in adultery, in the very act. What could be more crude and rude and brutal than this act of these religious rulers? As our Lord was setting in the temple area teaching the people, there is this hullabaloo outside. Then here comes these religious rulers dragging a woman with her clothes in disarray, her hair all disheveled, defiant, and resisting them. The crowd would naturally turn and look to see what in the world was happening. The religious rulers bring her right into the midst of the group that the Lord is teaching! They fling her down on the ground there, and make their crude charge. “This woman was taken in adultery, in the very act.” They wanted to trap Jesus between His allegiance to the Law and His merciful love for every one, even those who violated the Law. It was a trap and Jesus knew it, but He ended up trapping the trappers. She is guilty, there’s no doubt about that. And what she did was sin. 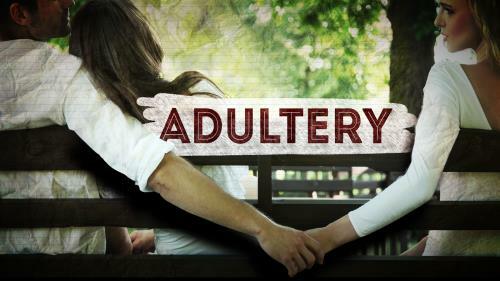 Our Lord called it sin—He finally said to her, “Go, and sin no more.” They knew the Law perfectly well: “And the man that committeth adultery with another man’s wife, even he that committeth adultery with his neighbors wife, the adulterer and the adulteress shall surely be put to death” (Lev. 20:10). Where was the man? The very fact that they did not produce the man also makes it apparent that they were not interested in enforcing the Law. They had another motive. (John 8:5-6) Now Moses in the law commanded us, that such should be stoned: but what sayest thou? This they said, tempting him, that they might have to accuse him. But Jesus stooped down, and with his finger wrote on the ground, as though he heard them not. They are right about the Law of Moses; there is no way of toning it down. She should be stoned. They are putting Him on the horns of a dilemma. Will He contradict Moses? Will He say something else, offer some other explanation? They did this to trap Him so that they might accuse Him. They didn’t really want to stone the woman. They wanted to stone Him. Our Lord knew that, of course—He “needed not that any should testafy of man: for He knew what was in man” (John 2:25). This scene is very interesting. The defiant woman is flung down before Him. The crowd has no respect for her embarrassment, her feelings, and they leer at her and crane their necks to see her, adding to her humiliation. Jesus stoops and writes on the ground. In effect, He dismisses the case. He will not join with her accusers. He will not so much as look at her to add to her embarrassment. He stoops down and writes as if He doesn’t even hear them. This is the only record we have of Him writing anything. He is the One about whom more books have been written, pro and con, than about any other person who has ever lived; yet He never wrote anything except this in the sands of the temple floor, which the wind or the feet of the crowd erased. What did He write? Of course we don’t know, but I can make a suggestion. As our Lord was setting in the temple area teaching the people, there is this hullabaloo outside. Then here comes these religious rulers dragging a woman with her clothes in disarray, her hair all disheveled, defiant, and resisting them.